The College of Medicine offers several options for students who may want to expand upon the traditional MD degree. Medical students have the opportunity to be elected into membership of the national medical honor society, Alpha Omega Alpha, (AOA). The Gold Humanism Honor Society honors senior medical students for demonstrated excellence in clinical care, leadership, compassion and dedication to service. A Humanism and Excellence in Teaching Award for Teaching Residents, and election of the members of Upstates chapter of the national Gold Humanism Honor Society. Medical students at SUNY Upstate Medical University can earn a Master of Public Health degree while earning their MD degree. Students will need to take a year off between the second and third years or third and fourth years of medical school to complete the MPH. The MD/PhD program combines academic medicine and medical research, and offers students a wide selection of research areas for their laboratory work. SUNY Upstate Medical University's Medical Scholars Medical School Preparation Program offers the opportunity to earn a Master's Degree in Medical Technology in preparation for application to medical school. As a rigorous one-year program, the Med Scholars Med School Prep program gives students the opportunity to strengthen and cultivate their academic, clinical and analytical skills. 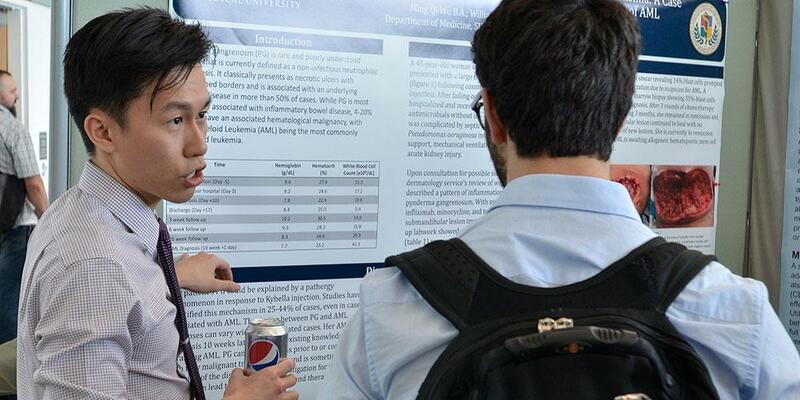 The Office of Research for Medical Students provides undergraduate and graduate medical students information on research at Upstate Medical University and off-campus institutions. Medical students in the Rural Medicine program spend nine months bridging their third and fourth years in a medically underserved community. The program, run by the Department of Family Medicine, is for students interested in careers in primary care or in practicing a specialty in rural areas or small towns. SUNY Upstate Medical University is committed to doing something about the shortage of doctors in small communities and rural areas in our region. Through the Rural Medical Scholars Program, Upstate will provide additional support for students who want to practice medicine in the state's underserved areas. SUNY Upstate also offers other options for medical students, including the summer Introduction for Basic Science Course before the first year of medical school, and the post-second year Pathology Fellowship. Last Modified: April 16, 2019. Contact Barb Hinds with questions about the content of this page.